The moment is measured in inch pounds, where the inch dimension is the ARM length and pounds are the force (weight) applied at the ARM location. The datum -0- is the point from which all ARM lengths are measured. For the airplane, the individual moments for each item are added to give the airplanes total moment (about datum -0-). Next the total moment is divided by the aircrafts flying weight, giving you the C.G. location. The flying weight will change for various pilot weights, passenger weights, and/or fuel amount. 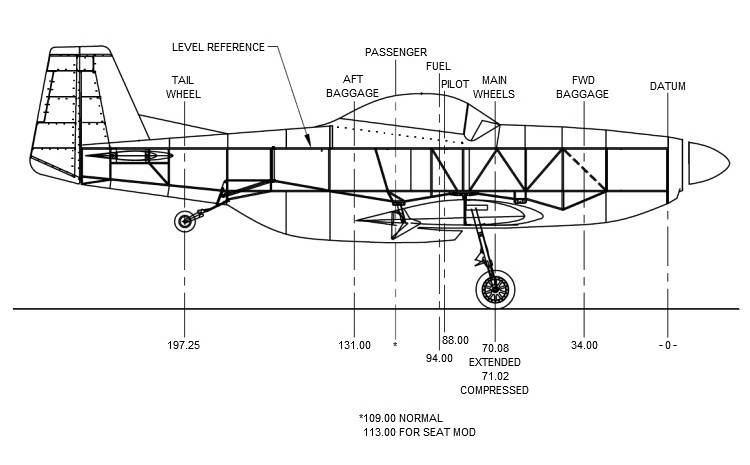 Perform weight and balance in no wind conditions with airplane leveled using fuselage tube shown as a level reference. Now experiment with different loading conditions, for example: Aft C.G. - 200 lbs pilot, full fuel, no baggage or passenger. Forward C.G. - heavy pilot, no fuel, heavy passenger or baggage. Divide moment by weight to get C.G. C.G. Location = Moment = = " C.G. • Do not leave any Weight or ARM numbers blank or the calculator will error out. I.E. If you are not carrying any baggage, put a zero in the weight spot.